Get your calendar and tracker to track your progress. No. It can be challenging to do 15 or 20 burpees. Don't compromise form and risk injury because you're pushing too hard. It's more effective to do six sets of 10 burpees. 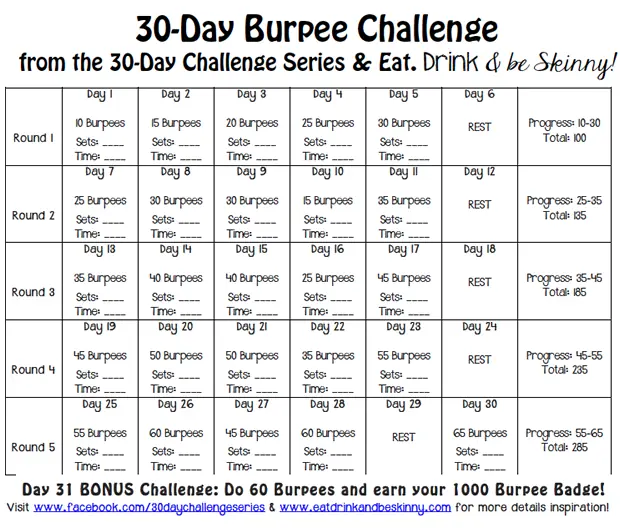 Decide how many burpees you'll do at a time and your burpee level. You don't need to do them all at once; break them up to hit the target number. Be sure to use proper form to maximize results and prevent injury. To maximize your results of this challenge, add in 30 minutes of cardio a day, three times a week along with your current fitness plan. At the beginning of the month, record your weight and basic measurements. At the end of the month, do the same thing to see your progress. Using your tracker, check off the days as you complete the activities and record the number of reps per set and/or how long it takes you to complete the work so you can track your strength. Don't ignore rest days. They are strategically placed to help your body recover to excel the next day. Be sure to check with your doctor before you start any new exercise regimen. Like the 30-Day Challenge Series on FaceBook. Get access to all the trackers by joining the community here. Let us know how your progress is going with the hashtag #Ihateburpees.